Staying at this very hotel was the happiest experience we've ever had. 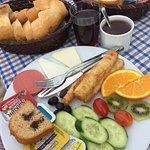 The head of the hotel (Veysel) is a kind and easy-going person. There're many friendly and highly organized personnel. Sitting and having a delicious meal (they have their own chef and he is just GREAT) on the Villa's veranda is just amazing and unforgettable, because it has fantastic view on the whole town and the old castle on the hill. The Villa is located on the edge of the town so it's not too easy to go downtown on foot. But as long as you don't have a car Veysel can give you a lift to the centre during the day. We love this hotel and we are very happy we booked a room there. 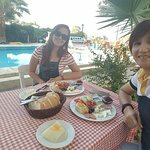 We were group of 14 woman travelling together in Istanbul and I have to manage the accommodation for them in advance, when I decided to choose this Villa as our place to stay for two days in Selcuk. 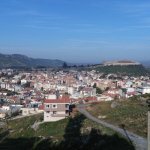 This place located in the hilltop of Selcuk and have a very beautiful view where you can see the town from above and also the Artemis ruins and the Ottoman palace. At night time you can see the light of the town spread out everywhere like a firefly surrounding you. The place is nice, they have 3 floor building, provide you will all amenities and also including a very delicious breakfast with very reasonable rate. One additional thing is the Dog, Achilles which is so adorable belong to the very kind hotel Owner Feysal who help us in arranging everything, including the tour and help me to go back to Ephesus looking for my friend's phone that was missing. Blessing in disguise, Back to Ephesus ruins in the late afternoon is something amazingly and rarely could be done without a good connection with the management over there, and I got the chance to enjoy Ephesus by myself without anyone around while the sunset make the view of the ruins dramatically beautiful.. Thaks for everything and definitely I will recommend your place to everyone who read my review here.. Arrived 4:30pm on 24 Aug, departed 9am on 25 Aug. Booking process and enquiries were a breeze. Carrie responded so quickly to my emails. It is located almost on top of a hill so the view from the hotel was amazing. However, our driver had a hard time looking for the hotel, it wasn’t the hotel’s fault. I asked the driver to call the hotel for directions but he didn’t want to. Veysel was very accommodating helping us order our dinner from the town restaurant. We could hear the ocean waves from our room. Room was decent and breakfast was generous considering that their rate is economical. If you’re looking for a budget hotel with a nice view and a pool where you can take a dip after a full day tour in Ephes, this is your place! But don’t set your expectations too high, you only get what you pay for! We spent a week at Villa Dreams enjoying the hospitality of Veys and his team. Lovely, generous and kind hotel staff who went out of their way to offer lifts to and from the centre of town and to make us comfortable at the hotel. The swimming pool was amazing - in the shade of palm and olive trees with a view of the distant mountains and the ruined St John's bazilika. The breakfasts were plentiful and delicious - the sweetest watermelon you've ever tasted. We had a family room on the top floor with a balcony overlooking the town and westwards across the plain of Kucuk Menderes towards the sea. Loved watching the sunset over the castle each evening. A special treat for us were the hotel pets - Dogs Asil and Lucy, the tortoises, budgie and Chino the crow. While the hotel staff were always happy to shuttle us to and from the centre of town, we loved the quiet walk through the back streets lined with orange, lime and pomegranate trees, bidding "iyi aksamlar" to family groups sitting out on the pavements on warm evenings. We witnessed a wedding party dancing the night away on a nearby square, and a circumcision party playing traditional music in a blocked off street. The local people were very friendly, smiley and helpful especially when we tried out our basic Turkish phrases. Villa dreams, with its pool and lovely shaded garden, is a perfect base from which to explore the region in the height of the summer heat. One of the most relaxing weeks I've ever had, despite the 38 degree heat. I love the place. It is perfect for visiting Efes and surroundings. It felt like coming home in this peaceful hotel (and actually I did not want to leave :)). The garden/terrace/swimmingpool is beautiful with great views on Selcuk and surroundings. Veysel and his staff are so kind. The family room is very spacious and has a large balcony. I could not stop looking around. Selcuk is a nice town with very friendly people. It is only a 15 minutes walk to go there for dinner at night. Villa of Dreams has a great view and well worth the walk to the top of the hillside. Hosts are very friendly and served wonderful Turkish breakfasts. I loved sitting out on the many balconies that look over to town Fort and the sea. Thanks for a great visit.